This module is based upon YodaHome's implementation of FreeCap for 1.1.6.3, and modifications made by me for 1.1.7. This module is in beta test at the moment, and I encourage those who are interested to try it out. Currently, this module works only for versions > 1.1.6.4 as it depends upon the UR framework. Requires version 1.1.6.4 or higher! You should now have, in your UR folder/subdir, a new folder/subdir called URCaptchaModule. That should be it. 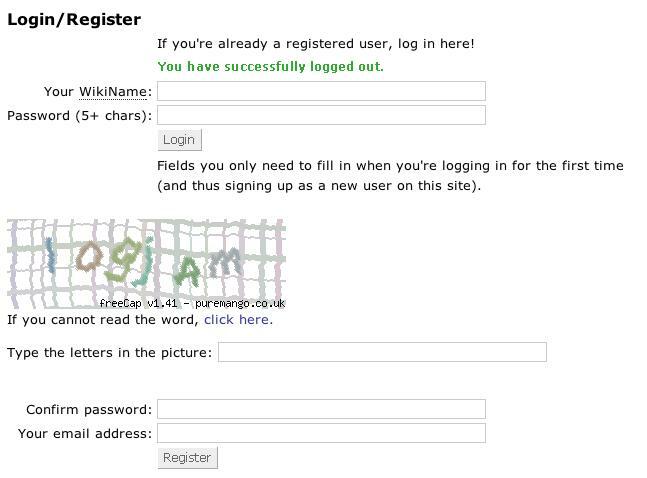 When you bring up your UserSettings page (logout first), you should see the CAPTCHA image and a textbox. Currently, the number of retries before requiring a browser restart is set to 3...to change this value (perhaps for testing purposes), open the freecap/freecap.php file and search for max_attempts. Change this value to whatever you want (999 works well for testing).